One of the most beloved pieces of Christian literature in this century now comes to you for the first time in this outstanding gift edition. With ten million copies in circulation, MY HEART-CHRIST'S HOME has for forty years vividly expressed what it means to bring every aspect of our lives under the lordship of Jesus Christ. Robert Boyd Munger imagines for us what it would be like to have Christ come to the home of our hearts. Room by room we consider with our Lord what He desires for us. Are we prepared to meet with Him daily in our living room? In the dining room we examine together what appetites should and should not control us. And is there a closet in our lives that He could help us clean out? This new edition includes "rooms" never before published. And the ten warm and inviting color illustrations by Andrea Jorgenson accent the message of this classic, helping us reflect on what it means in Ephesians 3:16 "that Christ may dwell in your hearts through faith." 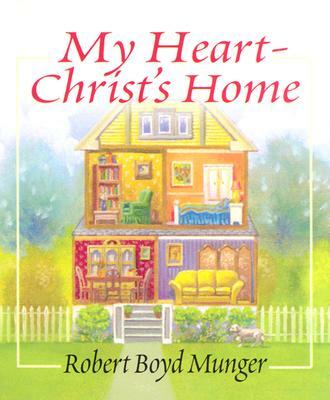 My Heart-Christ's Home by Robert Boyd Munger was published by Inter-Varsity Press in July 2001 and is our 23353rd best seller. The ISBN for My Heart-Christ's Home is 9780830822904. Be the first to review My Heart-Christ's Home! Got a question? No problem! Just click here to ask us about My Heart-Christ's Home.